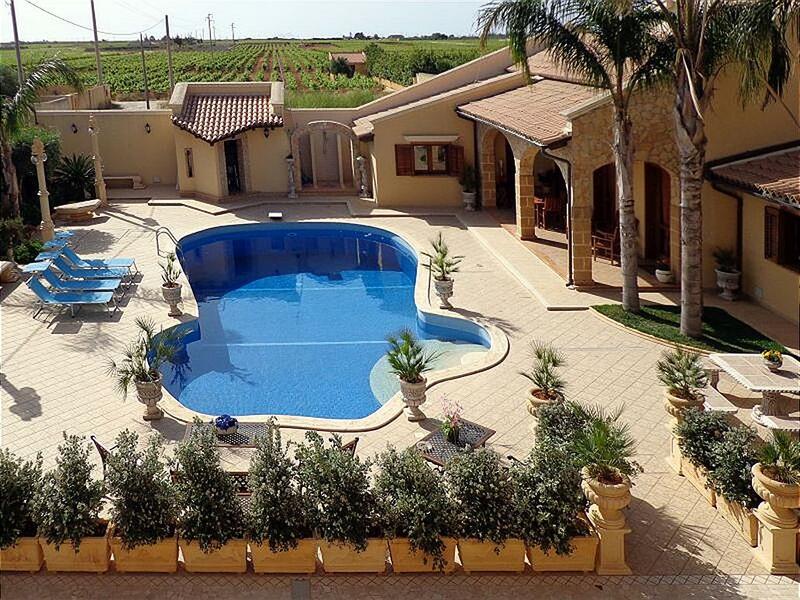 This villa is located in Mazara del Vallo, a town in southwestern Sicily, which offers a fascinating mixture of culture, ethnicity, art and history. Recently built, this wonderful little villa is located in an unique natural environment, designed essentially for couples or for families looking for a total relaxing and comfortable vacation. Outside the villa, just a short distance away is the famous beach of Tonnarella, a long and sandy beach with crystal clear water. The villa has a wonderful swimming pool surrounded by the typical Mediterranean vegetation and a cozy equipped veranda. Inside the house, at the ground floor, guests will find a wide and elegant living room, including a modern and equipped kitchen, a private bathroom with a shower cabin and whirlpool at their disposal. Upstairs there are two double bedrooms. All the rooms are air-conditioned and carefully furnished, in order to offer the maximum helpfulness and coziness. 2 double sofa beds, a private bathroom, parking space inside the estate and an outdoor veranda. The old town centre is flanked by the banks of the Mazaro river. It offers much to see, including the beautiful Piazza delle Repubblica with its cathedral and Spanish baroque seminary, a variety of fascinating churches, a lively and important fishing port. The town is also well-known for its seafood-based cuisine. The tourists can find several wine shops and cellars in the town. One of the few breweries in Sicily, Naxos, is located here. Visitors can take fantastic excursions through the historic alleys of the city or visit nearby sights like the famous Valley of the Temples of Selinunte, the Egadi islands or the pristine medieval town of Erice. The beautiful beaches offer the opportunity for a relaxing and carefree holiday. Also ideal for those who love fishing and water sports, or sports in general, thanks to nearby opportunities for football, tennis, windsurfing. By choosing this accommodation, guests may have the possibility, on request, of a customized welcoming service, consisting of a welcome basket with typical Sicilian gastronomic products, detailed information and customer care service on all the tourist services of the site, among which excursions, car/bike rental, catering and much more, and the possibility to make direct booking during all the period of their stay. Common garden - with chairs, table etc. In the event that guests arrive before or after the agreed hours, they are required to contact BungalowNet.